The item A perfect time for pandas : Magic Tree House Merlin Missions Series, Book 20., Mary Pope Osborne, (eaudio) represents a specific, individual, material embodiment of a distinct intellectual or artistic creation found in Charlotte Mecklenburg Library. The #1 bestselling chapter book series of all time celebrates 25 years with new covers and a new, easy-to-use numbering system! Time-traveling brother-and-sister team Jack and Annie have to find a certain kind of food. The magic tree house whisks them off to a village in the mountains of southeast China, close to a world-famous panda reserve. Will it be their easiest adventure yet? Not a chance! Jack and Annie don't know it, but they've arrived on the day of a historic earthquake!Formerly numbered as Magic Tree House #48, the title of this book is now Magic Tree House Merlin Mission #20: A Perfect Time for Pandas. Did you know that there's a Magic Tree House book for every kid? Magic Tree House: Adventures with Jack and Annie, perfect for readers who are just beginning chapter books Merlin Missions: More challenging adventures for the experienced reader Super Edition: A longer and more dangerous adventure Fact Trackers: Nonfiction companions to your favorite Magic Tree House adventures Have more fun with Jack and Annie at MagicTreeHouse.com! 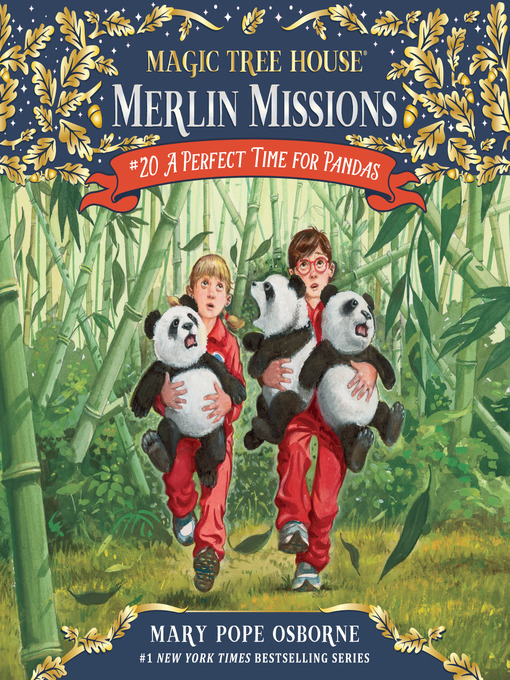 A perfect time for pandas : Magic Tree House Merlin Missions Series, Book 20. Magic Tree House Merlin Missions Series, Book 20.